Ce document au format PDF 1.5 a été généré par Microsoft® Word 2010, et a été envoyé sur fichier-pdf.fr le 26/03/2015 à 13:52, depuis l'adresse IP 62.39.x.x. La présente page de téléchargement du fichier a été vue 558 fois. Taille du document: 117 Ko (6 pages). of the 01/04/2015 to the 07/04/2014. residing in the United Kingdome. 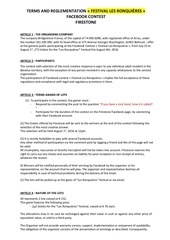 entered in the information form is equivalent to a proof of his or her identity. will apply in case of multi- participation. cannot be used to contest their valuation. entirely the responsibility of the winners. In case it cannot be delivered, the prize will remain available to the participant for 15 days. After this, he or she will no longer be able to claim it. prizes by prizes of equivalent value. The winner will be informed of the changes. 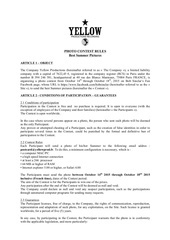 participation in the competition and to make the awarding of prizes possible. 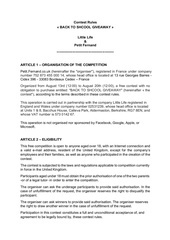 writing a letter to “the organizer,” whose address is mentioned in Article 1.
them any remuneration, right, or advantage, apart from the allocation of their prize. 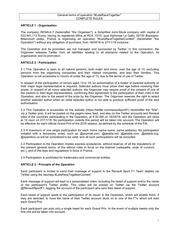 address is mentioned in Article 1.
to the site incurred by the participants will be reimbursed according to the terms below. disconnection to the site, as well as the connection time, for each participant. of the site, specifically given that normal use of the site cannot exceed 15 minutes per day. costs or expenses in connecting to the site and participating in the game. refunded, upon request, based on the current postal rate. 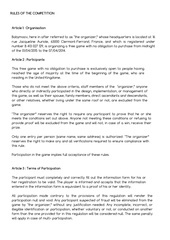 office located at 15 rue de Sarre BP 15126 57074 METZ Cedex 3.
components of this game, including this regulation, is strictly prohibited. reproduction constitutes an infringement punishable by criminal sanctions. part, constitutes an infringement punishable by criminal sanctions. participate in the game and/or the winners from receiving what they have won. guests as soon as the winners take possession of them. partner companies for any compensation whatsoever. 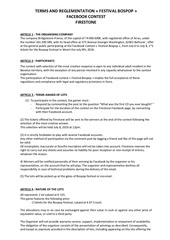 information relating to the game. “the organizer’s” systths and computer files will be legally binding. communication between “the organizer” and the participant. organizer,” notably in its computer systths. same force as any document created, received, or held in writing. Ce fichier a été mis en ligne par un utilisateur du site. Identifiant unique du document: 00314924.